Iranian-born journalist and book author Behrouz Boochani has won the Victorian Prize for Literature - Australia's top literature prize, which is endowed with 100,000 Australian dollars (€63,300, $72,500). Boochani won the coveted prize for his book "No Friends but the Mountains," which he typed out one chapter at a time on his phone. He wrote the book in his native Farsi and sent it to a translator via WhatsApp in Australia. Boochani, however, won't be able to attend a ceremony to accept the award, as he is not allowed to enter the country. The Iranian writer has been held at the Manus Island camp in Papua New Guinea since trying to reach Australia as an asylum seeker six years ago. Australia has sent asylum seekers trying to enter the country by boat to Manus Island or Nauru in the Pacific for processing for years. Those found to be refugees are barred from resettling in Australia, AFP reports. Since Boochani could not be in Australia to receive his prize his translator, Omid Tofighian, accepted the award on his behalf. "I don't want to celebrate this achievement while I still see many innocent people suffering around me," Boochani told the Reuters news agency in a text message, adding that one of his biggest fears while writing the book was that his phone might be confiscated: "I was worried that if they attacked my room they would take my property." 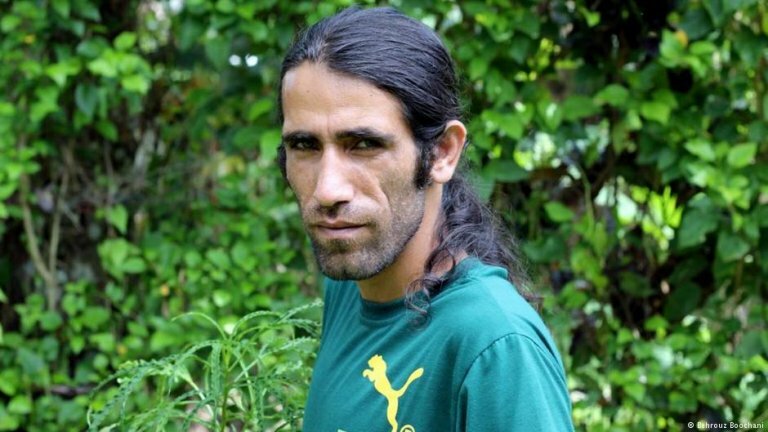 Boochani has been an outspoken critic of the off-shore camps like Manus that the Australian government uses to hold refugees who attempted to reach Australia. Australia has been sending asylum seekers who attempt to enter the country to off-shore camps in Papua New Guinea for years. Australia says it enforces this policy in order to deter potential asylum seekers from venturing out on a dangerous journey by sea, but the United Nations and other rights groups have criticized the living conditions in the camps as well as the long detention periods there.